Buy Natures Plus Animal Parade® Sugar Free online from our UK Health Food Shop. We sell Animal Parade® Sugar Free - 90 animals and other genuine Natures Plus products in the UK. Nature's Plus Animal Parade® Sugar Free Builds Healthy Bodies and Healthy Smiles. Children's chewable multi-vitamins & mineral food supplement. Where to buy Natures Plus Animal Parade® Sugar Free safely online? Shop at the Online Health Food Store if you are wondering where you can buy Animal Parade® Sugar Free - 90 animals safely online in the United Kingdom. 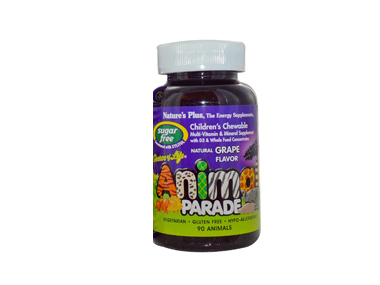 Animal Parade® Sugar Free - Animal Parade® Sugar Free - 90 animals in Children's Vitamins and Vitamins and Minerals.